It’s time to pull out your trusty motorcycle for another season of riding. The wide-open road awaits you and your bike as you get ready to head for parts unknown or maybe just relaxing rides around your local area. If your bike has been stored for the winter you will have to prepare it for riding. You will need to adjust valves. Do this when it is cold. If you have not done so over the winter now is the time. Give the cam lobes a shot of oil also as the old stuff has long run off. Pay attention to the cylinder head as it may need to be torqued. If you have maintained the battery all winter by a trickle charge or some kind of battery tender, it may be ready to go. Check the fluid and give it a slow charge. If you have not maintained it still do the service. Pay close attention to your battery. If anything looks amiss with the battery it may be time for a new one. Check the oil. Even if you changed it before storage water can cause issues with your oil. An oil change is simple and inexpensive so it’s best to take the extra step and change the oil before you start riding. Check the filter and change it if necessary. Remember to use a torque wrench on the drain plug. If you left the tank full (a good way to prevent rust) and use a fuel stabilizer you may be good to go. It is still best to drain the tank. Check the tank for rust and use this time to check the fuel filter and jets. If you see any issues you may need the advice of a professional. Pull the plugs and give each hole a shot of oil. Spin the engine a few times as this will help protect engine walls and cylinders on the first few turns. Check the gaps on the plugs while you have them out. Also check the air filter, drive line fluids and other regular service items. Install fresh fluid. Check the brake pads and shoes. If they feel a little thin or seem to be worn replace them with new ones. Your should never take chances on your brakes. Inspect your tires for any signs of wear. The pressure should be checked. Also look at spoke tension and wheel bearings. Just like your brakes, never take chances with your tires. Check for looseness in the steering head. Tighten it if necessary. The fork head oil needs to be checked. Inspect any seals to see if they are leaking. Look at the overall condition of your bike. Consider giving it a good wax job. Treating the leather on seats and saddlebags will prolong their life. Your owner’s manual will help you stay on track with routine maintenance after your motorcycle has been stored. Always follow manufacturer’s recommendations. 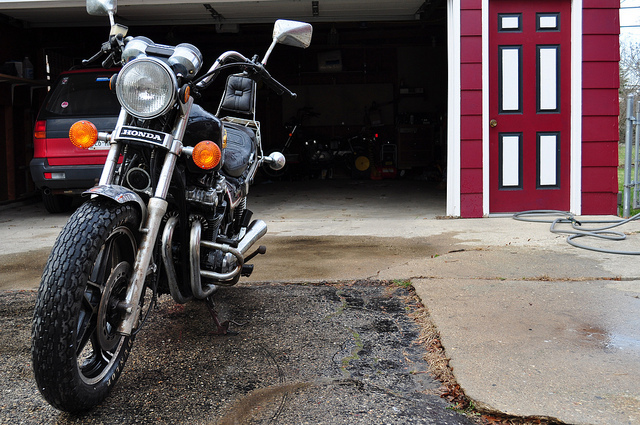 You want your motorcycle in top shape for when the time comes to hit the road. Remember, a little maintenance goes a long way. Maintain your bike and enjoy the ride! Image by aperture_lag and licensed through Creative Commons.